What kid (and adult) doesn’t love a nice cup of hot chocolate on those cold Canadian days? I know it’s a favourite for us around the holidays. Nothing beats a fresh cup of hot cocoa after a day of skating on the pond. Truth be told, I’ve actually stopped drinking it years ago after I changed my diet. Have you ever actually read the list of ingredients in some of those pre-packaged things? Yikes. While I choose to simply live without it, now I have a toddler in my house who wants what everyone else is having… so what’s my solution? We came up with our own, healthified (if you will), dry hot chocolate mix … that can stay in the cupboard just like any other hot chocolate mix you buy. That means it’s ready to go for when the kids come in from playing outside, or unexpected company shows up for a warm drink. Mix all ingredients well in a bowl. Transfer to glass jar for storage. To make, simply dissolve desired amount of hot chocolate mix in boiling hot water (about half your cups worth of hot water). Top with warm milk of your choice. 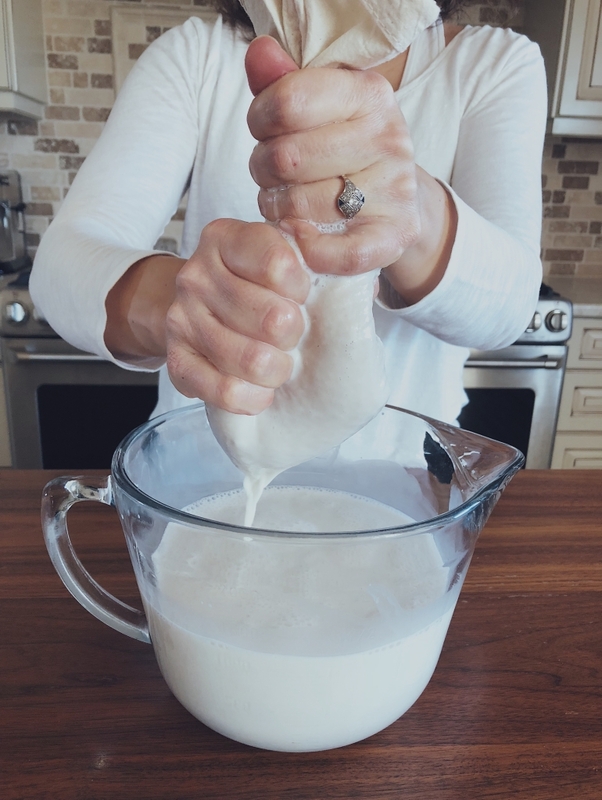 Note that because this mixture doesn’t contain any kind of powered milks, it’s best served with half hot water, and half warm milk of your choice (it’s AMAZING with homemade nut or seed milks). This makes just over 2 cups of dry mix. Freezes well!If you really want to go all out, you can top with homemade marshmallows. We always make a bunch around the holiday season and have ready to grab in the pantry. It’s easier than you think. Our FAVORITE recipe to date has been from Danielle Walker in her cookbook Celebrations (I HIGHLY recommend any of her cookbooks). For a quick look at how she makes them, click here. This also makes an excellent gift idea for around the holidays. 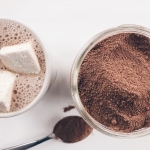 Who doesn’t love homemade hot chocolate mix with some homemade marshmallows! In cooking up come fresh pumpkin for my son, my step daughter and I decided to creative in the kitchen! Who doesn’t love a beautifully spiced pumpkin recipe? Heat oven to 375F. Whisk together eggs, coconut oil, vanilla and coconut sugar in a large mixing bowl. Once combined, stir in the pureed pumpkin. Mix remaining dry ingredients in a separate bowl. Add dry ingredients to wet ingredients and stir well. 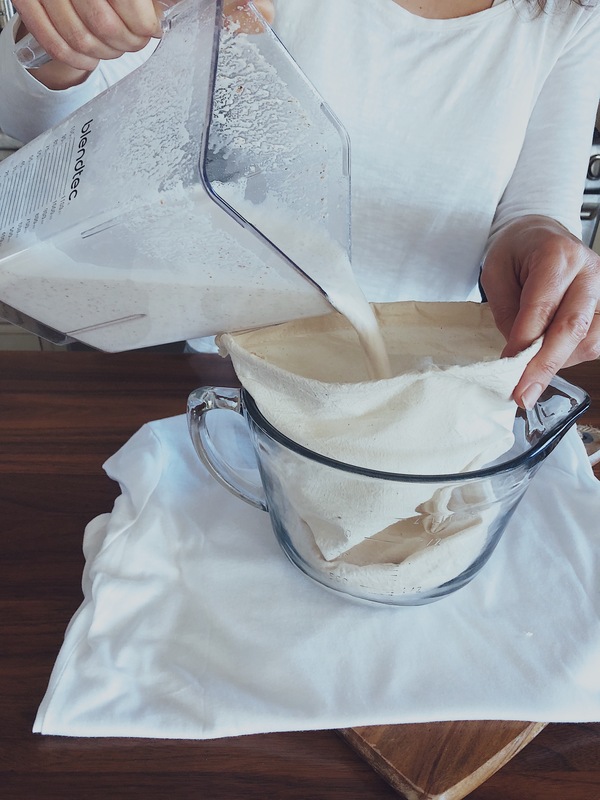 Allow batter to sit for approximately 10 minutes to allow the coconut flour to absorb some of the liquid. Scoop into greased muffin liners to about 3/4 full. Top with chocolate chips or chopped pecans (optional). Bake for 20-25 minutes or until golden brown and toothpick comes out clean. 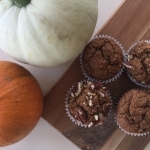 The perfect fall muffin. Full of zucchini and all the spices of fall! 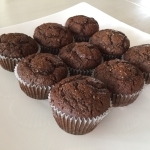 This is based on the chocolate zucchini muffin recipe, with some changes!! 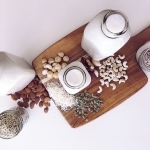 This recipe is nut-free (yay! the kids can take it to school), gluten-free, and the best part? You’ve never guess they’re not full of gluten! Heat oven to 375F. Whisk together eggs, coconut oil, vanilla and coconut sugar in a large mixing bowl. Mix remaining dry ingredients in a separate bowl. Add dry ingredients to wet ingredients and stir well. Mix in zucchini. Allow batter to sit for approximately 10 minutes to allow the coconut flour to absorb some of the liquid. Scoop into greased muffin liners to about 3/4 full. Sprinkle with coconut sugar and cinnamon if using. Bake for 20-25 minutes or until golden brown and toothpick comes out clean. These freeze excellent! And this recipe is very easy to double if you’re wanting to use up that garden zucchini! This is probably one of the main reasons I invested in an Excalibur 9-Tray Dehydrator. The kids (and all their friends) love these so much, I can’t keep them stocked up. It’s a wonderful treat for lunches, snacks, camping, road-trips or for when fruit isn’t in season. I haven’t found a kid yet would didn’t love these. And on the plus side, they are crazy simple to make and you can pretty much make them out of anything! If using frozen fruit, leave in a bowl on the counter overnight to thaw. 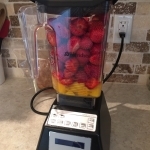 Place all ingredients in blender (may have to do in batches) and blend until smooth. Line dehydrator trays with Excalibur re-usable sheets (or parchment paper). 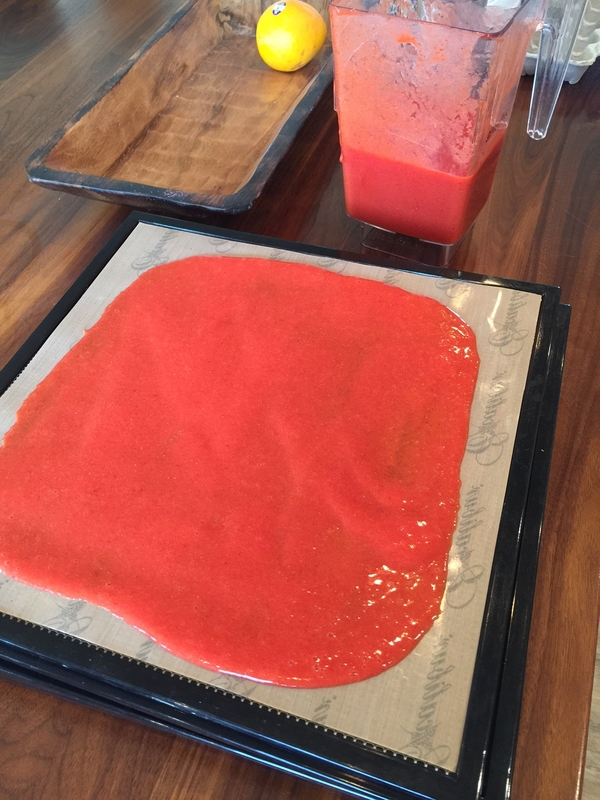 Put about 1 1/2 cups of the mix onto the tray and spread into a square shape as evenly as possible about 1/8″ thick***. Place prepared sheets in the dehydrate and dehydrate at 115 degrees F for 8-10 hours. (Dehydrating time will depend on how thick (and how even) they were spread on the sheets). I find it works best to put them in the dehydrator first thing in the morning and then start checking them mid to late afternoon. You want them flexible, but not wet. You should be able to brush your hands over-top and nothing should stick or indent. When they are ready, remove from dehydrator and rip into pieces. Store in air tight container. Will last for months! Although that’s never happened in our house If you do find any pieces that are too soft or still wet, eat those pieces immediately. ** I always have about 1/3 of the fruit either mango or pineapple. 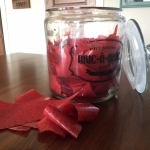 It does something to the texture so they feel more like fruit roll-ups for the kids. (I get frozen bags of organic mango from Costco). 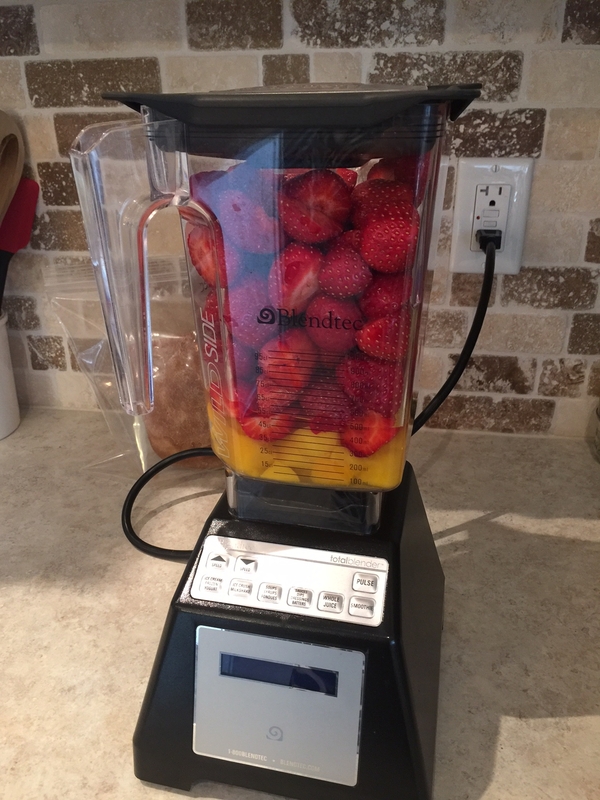 The kids favourite combo is mixed berry (strawberry, raspberry, blueberry, blackberry) and mango. I’ve attempted to add in banana. My kids didn’t like care for it as much. 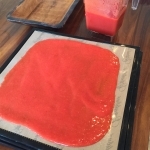 As fresh fruits are available locally in your area, I stock up and make what I can with the fresh stuff, and freeze the rest to use at a later date. *** The instructions given are for an Excalibur dehydrator with 12″ square trays. This recipe should fill 8-9 trays. 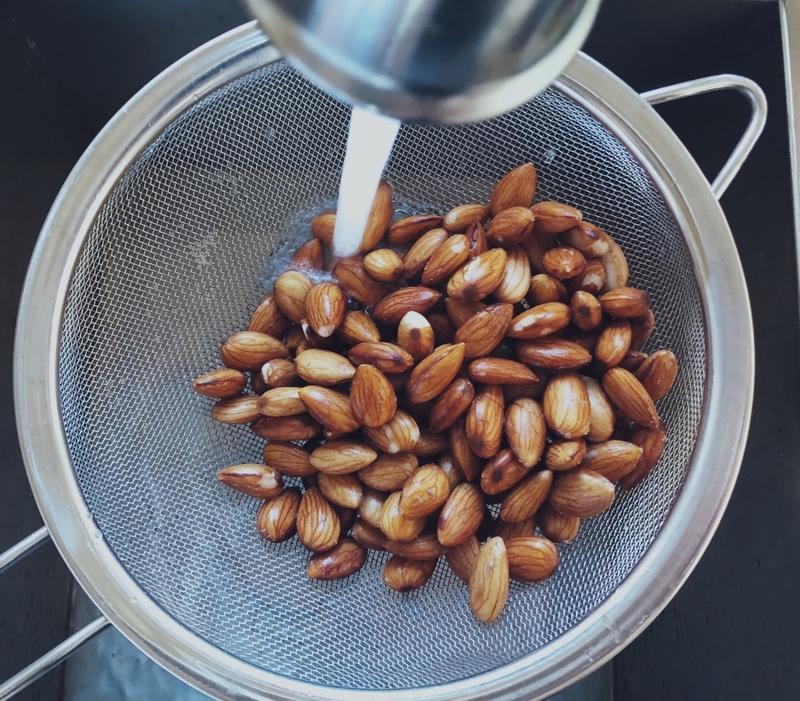 If you have a different dehydrator you may have to add more or less batter to each tray. Looking for ways to use up that zucchini from the garden? 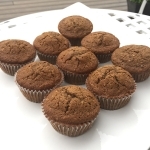 This muffin recipe came from a dear friend, who’s been working to “healthify” the traditional chocolate zucchini muffin for years. And this is what she came up with! Not only can you actually use up a good portion of your zucchini, you can also feel good knowing there’s lots of added nutrition in these babies! And the best part – they taste better than the traditional recipes you’re used to. 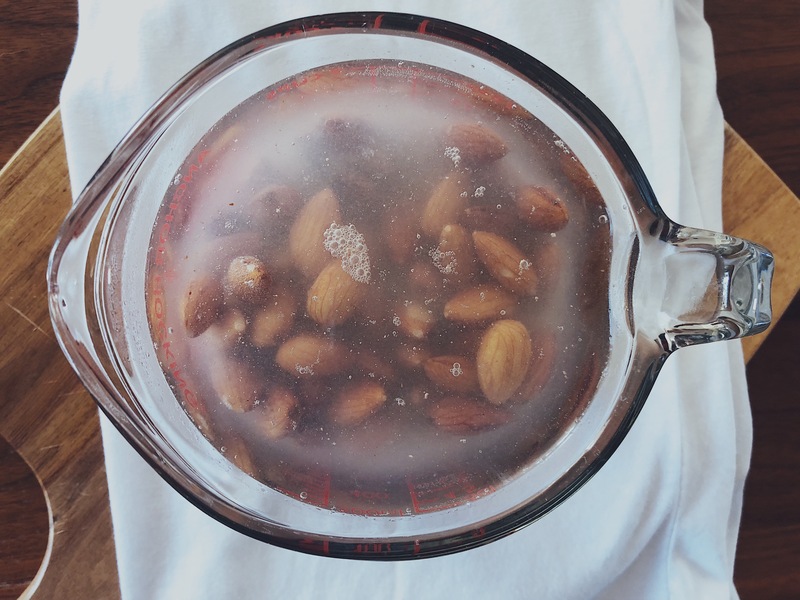 This recipe is nut-free (yay! the kids can take it to school), and I’ve also included a gluten-free version as well! Heat oven to 375F. Whisk together eggs, coconut oil, vanilla and coconut sugar in a large mixing bowl. Mix remaining dry ingredients in a separate bowl. Add dry ingredients to wet ingredients and stir well. Mix in zucchini and chocolate chips. Scoop into greased muffin liners to about 3/4 full. Bake for 20-25 minutes or until toothpick comes out clean. 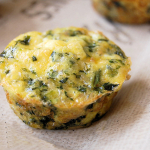 Allow batter to sit for approximately 10 minutes before scooping into muffin liners, so the coconut flour has a chance to absorb the additional liquid. 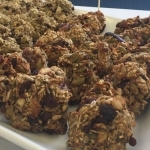 These breakfast cookies have been a lifesaver for me! My dear friend sent me home with a bag of these cookies and we LOVED them!! Truth be told, they were all I could eat during labour and just after having my first baby. When I asked for the recipe, she said she just threw stuff together! So when I was home from the hospital and feeling good enough, I took her list of ingredients and re-created them to make a recipe to share with all of you! They are jam packed full of great ingredients, are sugar-free, gluten-free, egg-free & can easily be nut-free! Pre-heat oven to 350 degrees. 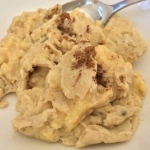 In a large mixing bowl, mix the canned coconut milk and mashed bananas (if your coconut milk is too chunky, I heated it on the stove until it was liquified, then mixed it in with the bananas). Once bananas and coconut milk are well mixed, add in the remaining ingredients. Mixture will appear milky or soupy. Spoon onto parchment lined cookie sheets. Press cookies into a round, flat shape, so they stick together when baking. Bake for 15-20 minutes, or until the edges are just during golden brown. Allow to cool for 5 minutes on cookie sheets before removing to cooling rack. Cool completely before refrigerating or freezing. These freeze EXCELLENT! I made a double batch and froze them all! Perfect for breakfasts on the go, or when you just don’t have time to be in the kitchen (which is actually often for me these days)!! You also can easily make this recipe your own by adjusting the dry ingredients to whatever you enjoy! I know what you’re thinking … bananas and eggs?? We were thinking the exact same thing when my 7 year old niece said she wanted to cook this for breakfast. Turns out we were all shocked when we tasted her creation. It taste like sweet french toast… without the bread or the the sugar! I dare you to give this a try and not absolutely love it! Heat coconut oil in frying pan over medium heat. Add all ingredients to the frying pan. Cook until eggs are fully cooked. Can top with anything you like. My niece had her eggs topped with maple syrup and mixed berries, and I enjoyed mine without adding a thing! This recipe came from one of my dear friends. It’s one of those great, filling salads that store well in the fridge for your busy work week, or is good enough to take to a family occasion. 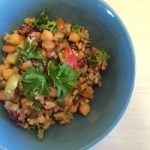 It can easily be adapted to your family’s likings and complements any summer time meal. Enjoy! Cook one cup of the rice of your choice. Make sure not to over-cook as you want your rice firm in your salad. I cook the quinoa, wild rice and brown rice in one pot. Once cooked, remove from heat and allow to cool completely. 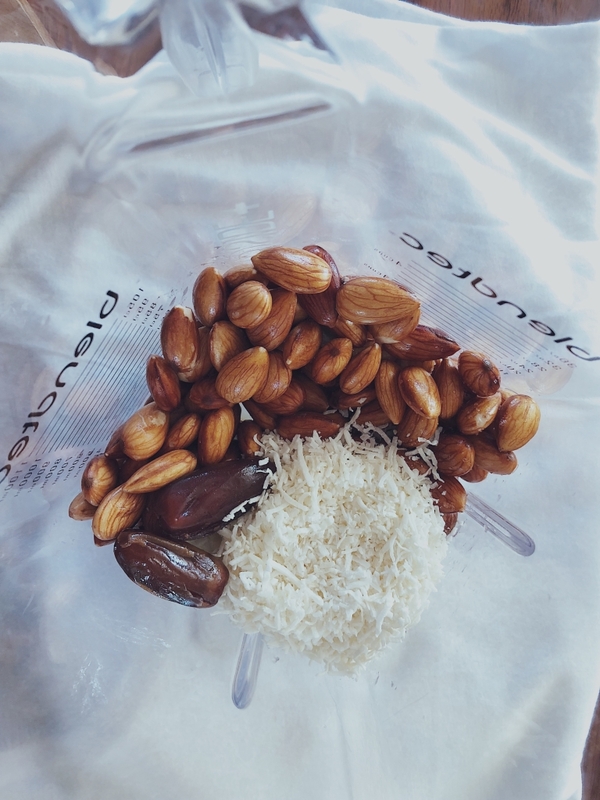 Add all dressing ingredients to a blender. Blend for about 30 seconds until creamy and well combined. Add all ingredients to large bowl and toss with dressing. You may need to add more sea salt to taste. This stores excellent in the fridge for up to a week. Great staple to make for the week. It’s beautiful topped with fresh chopped tomatoes or avocados. Although I add to each serving bowl, as adding it into the salad wouldn’t make it last as long to store in the fridge.